Join the Musketeers D'Artagnan (Michael York), Athos (Oliver Reed), Aramis (Richard Chamberlain), Porthos (Frank Finlay) and the stunning yet clumsy maiden Constance (Raquel Welch) as they battle for fortune, glory and vengeance against the devious Cardinal Richelieu (Charlton Heston), Milady de Winter (Faye Dunaway) and Count de Rochefort (Christopher Lee). These are the two hit movies that redefined the rousing action and riotous comedy of the swashbuckler genre for a whole new generation. This is THE COMPLETE MUSKETEERS! Director Richard Lester (A HARD DAY'S NIGHT, HELP!) and producers Ilya & Alexandre Salkind (SUPERMAN) created an international sensation with these all-star adaptations of Alexandre Dumas' timeless tale. 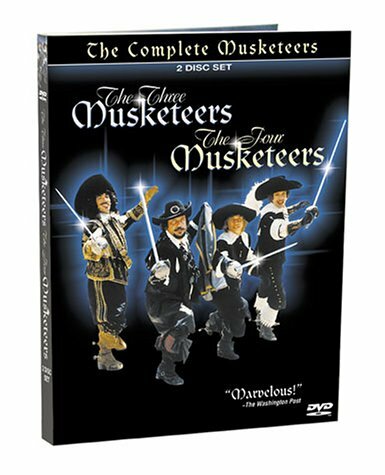 Both THE THREE MUSKETEERS and THE FOUR MUSKETEERS have now been completely restored from original vault elements and loaded with exclusive extras for the ultimate two-disc Musketeer collection!